In 2006, a 747-400 experienced an AoA sensor with a large positive bias. The AoA sensor had not been assembled correctly, and a set screw allowed the Vane input shaft to rotate relative to the resolver, introducing an offset or bias. In this case, the bias was somewhat random. When the unit was placed on test, it failed the part of the test schedule where the vane, positioned at discrete points throughout its operating range, should result in specified electrical outputs supplied to the ADCs. These were somewhat random in nature and subsequent disassembly revealed the main drive gear to be loose, being able to rotate freely 360° around the main shaft. The counter-weight was also found to be loose and had a free play of about +/‐ 2 ° rotation. 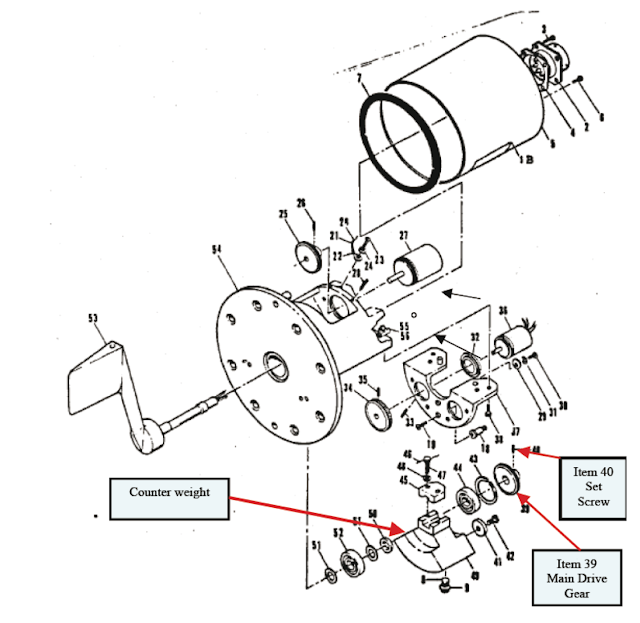 Examination of the main gear revealed that the set screw that secured it to the shaft was not fully tightened: the overhaul manual specifies an assembly torque of 4.0 ‐ 4.5 inch‐pounds for this item. This was established as the reason for the random readings of the resolver outputs with respect to vane displacement, which thus resulted in the right ADC receiving erroneous angle of attack data. The "random" offset described in the 747 case does not match what was observed in JT043 and JT610, where the large bias remained fixed. Reliability of the AoA sensor was evaluated over a 4-6 year period, with a mean time between unscheduled removals was 93,000 hours. A typical airframe is modeled at about 100,000 hours, so the AoA vane typically last nearly the lifetime of the airplane. Related to the 747 report is the lack of any correlation from AoA large bias to Airspeed and Altitude Disagree. There should be a clear relationship from AoA disagree to causing Airspeed and Altitude Disagree (due to incorrect static port compensation). This is true for flight crew benefit (if AoA disagree, expect Airspeed and Altitude Disagree) and for maintenance, to not service Air Data and instead service AoA. It was apparent in this instance, and yet it shows up again in Lion Air 13 years later (no correlation of Airspeed/Altitude Disagree to an AoA malfunction). One stick shaker on and the other off is AoA disagree, even if you don't have a dedicated alert. In prior posts I have postulated whether SMYD had become a function in the FCC on the MAX. I was wrong. The SMYD appears on the 737 MAX pretty much as the 737 NG. This is a significant realization. The AoA vane has one analog resolver output connected to the ADIRU, and one output connected to SMYD. The ADIRU provides AoA to the FCC, where MCAS uses it for triggering its trim command. On JT043 and JT610, stick shaker and MCAS appear to be triggered. This means both SMYD and ADIRU/FCC AoA sensed angle were in agreement, subjected to a large bias. This means the AoA sensor output was in error, not any input signal processing. The removed vane prior to JT043 exhibited a different failure (out of range) and there is no information released from ET302. The SMYD faults from Air Data invalid (from ADIRU) must be related to AoA signal not being available for static port compensation. Lion Air replaced the vane prior to JT043. The error that was found on the 747 would have been evident if the vane output was checked against a calibrated position (by rotating the vane to particular points, the output has an expected value). If the failure was internal to the AoA sensor, then it should have failed the installation test. If it was bent (as I had originally concluded), then the calibration would be fine and the only hope is visual inspection. The vane removed prior to JT043, the vane on JT043/JT610, and the vane on ET302 (presumably) all failed in some manner. This trend will surely be subject of further investigation. Boeing has released a description of the MCAS related changes they are proposing. Flight control system will now compare inputs from both AOA sensors. If the sensors disagree by 5.5 degrees or more with the flaps retracted, MCAS will not activate. 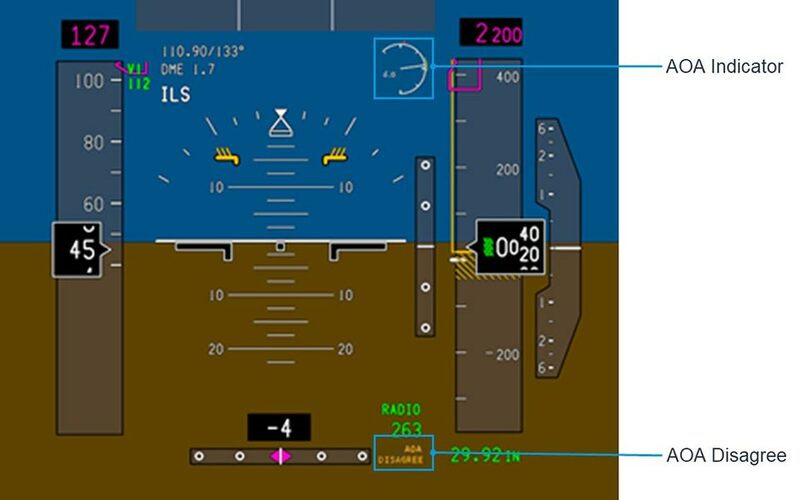 An indicator on the flight deck display will alert the pilots to AoA Disagree. MCAS can never command more stabilizer input than can be counteracted by the flight crew pulling back on the column. The pilots will continue to always have the ability to override MCAS and manually control the airplane. 1) MCAS will be inhibited if AoA sensors disagree is the feature missing from the very beginning. 2) The AoA Disagree Alert will ensure maintenance is directed to AoA sensor. I hope it will also correlate to Airspeed Disagree and Altitude Disagree. 3) MCAS will have one trim command, reset only after AoA shows a recovery. 4) No known or envisioned failure modes is a grandiose statement. Of course there are failure modes, the point is managing the failure rates by design features. 5) This is a bit of a misleading statement, but the point is that with at most a 2.5 degree nose down trim command, there is sufficient elevator to offset the pitch command. This assumes the airplane was roughly in trim when MCAS applies its trim, not for example if the stab/elevator start from a mistrim position. 6) Boeing is touting the ability to hit the cutout switch to stop MCAS. The AoA indicator remains a customer option, but it is now a no-cost option. 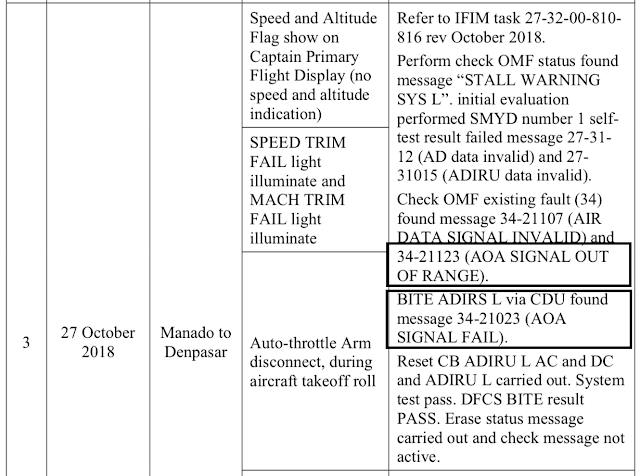 Boeing and the FAA continue to claim that MCAS malfunction is easily detected and all flight crews are at the ready with the runaway stabilizer checklist and using the cutout switches. Yet what has been shown with JT043, with JT610, the flight crews were not able to detect the MCAS malfunction as a runaway stabilizer. We don't know what happened on ET302 yet. For the first time, Boeing admits MCAS is an extension of Speed Trim, which I have long suspected, and why it was designed with a single input. Speed Trim is constantly applying stabilizer trim commands in manual flight. This masks MCAS trim commands. Further, MCAS trim commands are effectively a slowover and in the case of the Lion Air flights, intermittent. These factors, combined with the flight deck effects from the high AoA value causing high workload, interfere with the expected human response. There has yet to be any acknowledgement of this, rather the opposite by ignoring it. The FAA repeatedly made the same assertion, the MCAS malfunction is easy to detect. Another issue I think that the hazard assessment undervalues is the removal of the aft column cutout switch for MCAS commands. This feature is related to human factors as well, where a pilot encountering a nose over dive may not reliably trim stabilizer nose up, but rather will simply pull back on the yoke. Without the aft column cutout, and under the failures in the software today, but also possibly due to hardware failure, the MCAS commands can drive the stabilizer to an out of control situation. I understand why Boeing cannot use the aft column cutout switch with MCAS. I would then counter that MCAS failure is Hazardous. I would expect a second processor and hardware path to ensure on single hardware failure could not drive MCAS trim commands (effectively FCC trim commands if by hardware failure). This feature already exists for autopilot command mode. Perhaps Speed Trim is also vulnerable. The response to a stabilizer runaway is to cutout the electric trim. Nowhere does anyone caution the consequences of using manual (turn the wheel manually) trim. 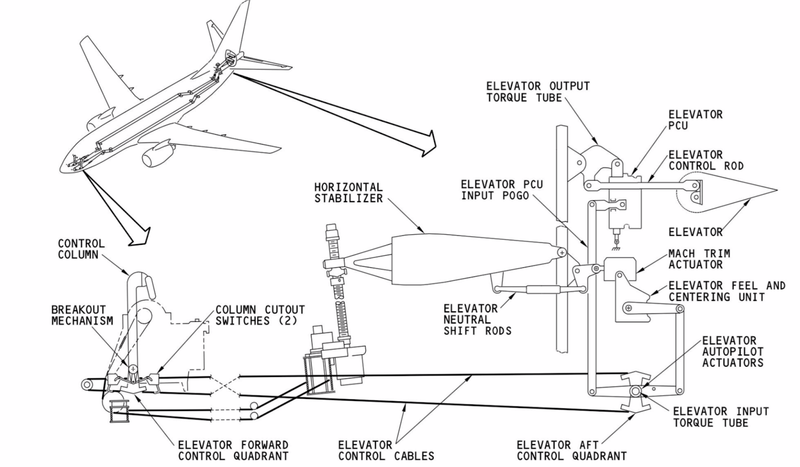 The manual trim wheel can be very hard to turn if subject to high aero loads, and particularly if the elevator is commanded significantly (loading the stabilizer). We learned all about these maneuvers in the 1950-60s. Yet, for some inexplicable reason, Boeing manuals have since deleted what was then - and still is - vital handling information for flight crews. The standard response to just hit the stabilizer cutout switches and manually trim is actually flawed. If the nose has been pushed down by significant mistrim (nose down stabilizer, nose up elevator), and as airspeed increases, it may not be possible to trim the stabilizer manually nose up without letting the elevator go to a neutral position. The reality, under the MCAS runaway scenario, trimming nose up immediately stops MCAS as well as trims the stabilizer back towards an in-trim position. At that point, you would be best off to cutout the stabilizer. Many flight crews may not know that you have to relax the elevator to manually trim the stabilizer if the loads is too high. The Senate hearing brought out some interesting tidbits. Of course there were accusations that the FAA has delegated too much to Boeing. There was outrage that Boeing charged for the AoA indicator (to which Boeing has relented and will offer it a no-cost option). FAA acting administrator Elwell made several key errors. 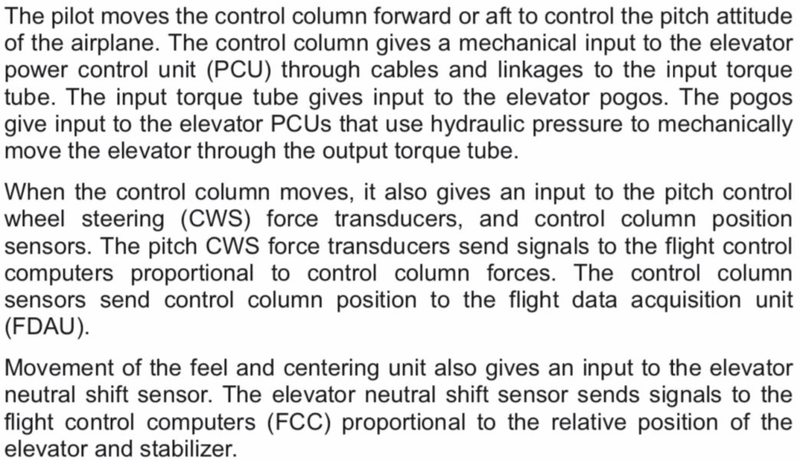 Elwell claimed the aft-column-cutout switch function works with MCAS. It does not. He may have been confused by Boeing saying elevator has sufficient authority to offset a 2.5 deg. mistriim. Elwell claimed repeatedly that an MCAS malfunction was easy to detect as stabilizer runaway, and that every crew can deal with that. It has not been evident that MCAS malfunction is apparent to the flight crews, and as stated above, the recovery by cutout switch may leave the airplane under dire circumstances if reliant on manual trim. Elwell inexplicably claimed that the 737 MAX is fly by wire. It is not. 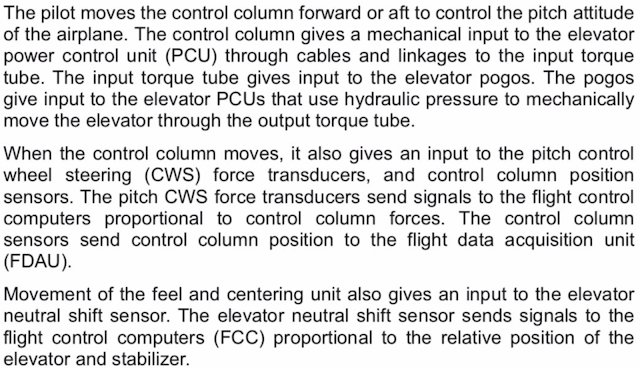 Column moves cable which moves hydraulic actuator. Elevator feel system provides force feedback. This is fly-by-cable. The preliminary report from ET302 is expected in the next few days. It still ignores an underlying problem: if MCAS is needed for flight safety, how can you safely turn it off? If it is not needed for flight safety, why does it exist? And what are the numbers proving that it is sufficiently unlikely to engage on takeoff, which would kill everyone even if the pilots did everything right? This is a surprisingly complex piece of kit. Think you found the explanation for ET302 crash. After cutout in a dive, you cannot trim manually quickly. In addition blowback can stop elevator! In fact the inability to wind back the trim manuall under high elevator load is the only reasonable explanation for the second crash. For sure every 737 pilot was aware of the MCAS and the cutout switches after the AD following the LionAir crash. But the AD did not warn for this trap you describe. Thank you for sharing all your well thought analysis including corrections as facts evolve. IMHO best info on MAX here together with Bjorn Fehrm / Leeham. 0861FL1 assy has Travel stops at + - 105 DEG (from AOA Vane Dowel Points, witch is also the Airplanes Azimuth line). It is not the Resolvers that limits the Maximum Travel, it is a Hard stop that stops the Counterbalance Weight. There are also an Viscous damper that will cushion any rapid Vane movements I.e. by wind gusts on the ground. The Boeing 747 uses Rosemount AoA sensor P/N 0861HB, which has two resolvers. 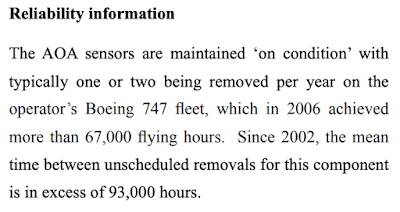 The Boeing 737NG and 737MAX use Rosemount AoA sensor 0861FL or 0861FL1, which have only one resolver. This means that on the B737, the left ADIRU and the left SMYD get their information from the same left AoA sensor output and the right ADIRU and the right SMYD gets their information from the same right AoA sensor output. 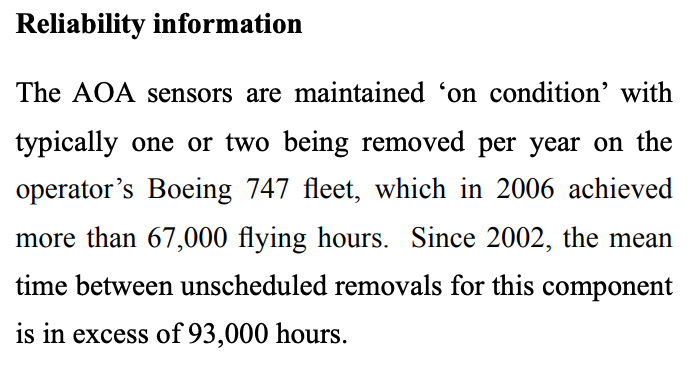 The 737NG and 737MAX uses PN: 0861FL1 Rosemount AOA Sensor. This Part Number has TWO Resolvers and a Viscousus damper. A faulty SMYD computer may short SIN to GND and the FCC would also see 0v in SIN. Two sensors will not fail in a row, unless the plane breaks them.
" 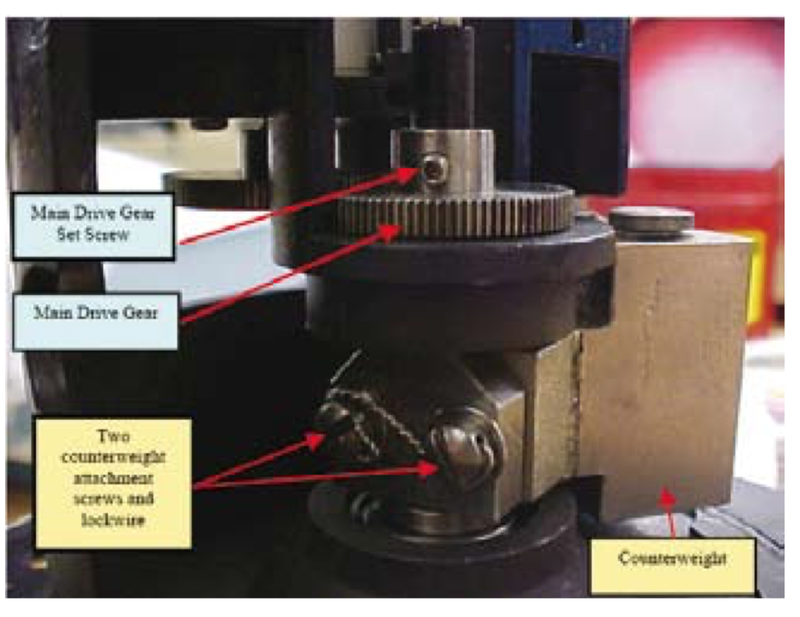 Examination of the main gear revealed that the set screw that secured it to the shaft was not fully tightened: the overhaul manual specifies an assembly torque of 4.0 ‐ 4.5 inch‐pounds for this item"
Should not that Gear be set on a " Keyed " shaft? Why would something so critical be given over to a " set screw?" Exactly- set screw on a shaft works great for toys and record players. proper would be a Dshaped shaft with set screw or even a three sided shaft- collar arrangement with three set screws or better a D shaped shaft with a split ring to control fore and aft. It is amazing that the so called reliability records seem to show absent a bird strike or ramp rash or tighter is better or to fit it force it issue, they last the normal life of the airplane ??
" Examination of the main gear revealed that the set screw that secured it to the shaft was not fully tightened: the overhaul manual specifies an assembly torque of 4.0 ‐ 4.5 inch‐pounds for this item. " Why isn't that gear " set " on a keyed shaft? Why would something so critical be given over to a " setscrew?" Today’s edition (April 23, 2019) of the Minneapolis Tribune has an article about the Cirrus Model SF50 aircraft, telling that all 150 of these aircraft in the field have been grounded recently by the FAA because of three incidents involving the stall warning and protection system (SWPS). Quoting from the newspaper article: “The first incident occurred in November  while an SF50 was under manual pilot control. In that case, the airplane activated several downward pitch commands along with stall warning, stick shaker, and several associated alerts. The pilot was able to stop the automatic pitch commands by pressing and holding an autopilot disconnect button and was able to safely land at the intended destination. In the second incident, the pilot reported a stall warning and stick pusher failure in flight. In the third case, the airspeed indicator went red and the stall warning and stick shaker were heard and felt while on descent. The autopilot was disengaged and the pilot was able to land without incident”. Quoting further from the newspaper article: “The FAA noted that Cirrus and Aerosonic, the Florida company that manufactures the sensor in question, have identified the probable root cause of all three flying incidents: a malfunction in the AoA sensor because of a quality control problem on the assembly line. The quality problem was narrowed down to two sets of sensor screws having improper torque and threading issues. The FAA has ordered that all AoA sensors on the SF50 models be replaced”. 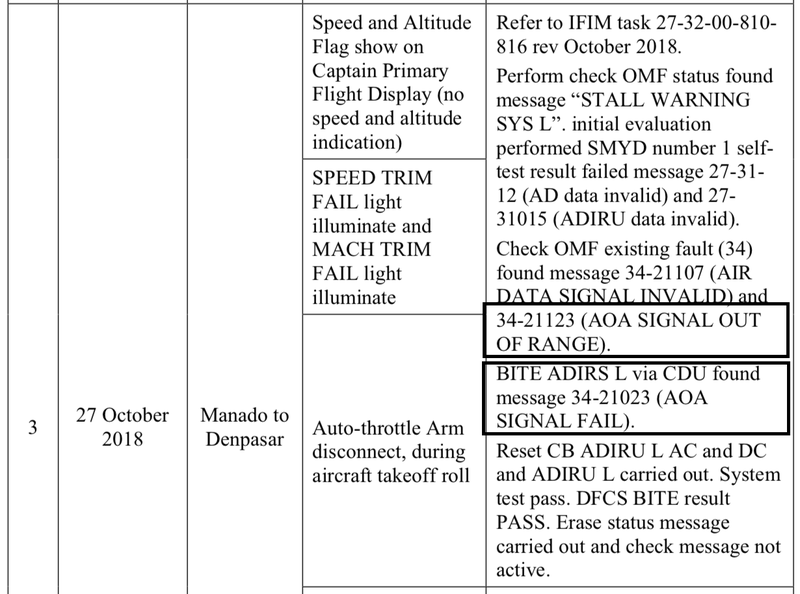 Although these three incidents differ from the Boeing 737Max incidents by involving a different aircraft, different electronics, and different AoA sensor manufacturer, they are astonishingly similar in their effects on the aircraft’s stall warning system and in the implication of a defective AoA sensor as being the suspected cause. 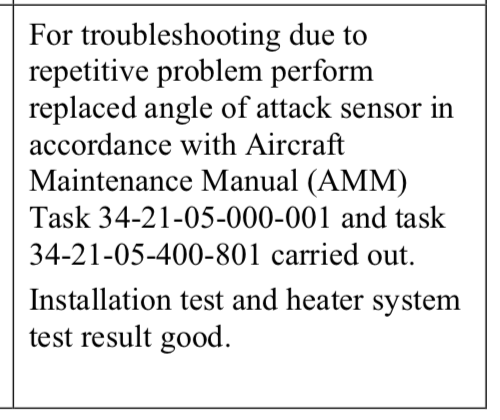 And while the AoA sensors in question may have a totally different design, it is interesting that the FAA has narrowed down the root cause of the AoA sensor defect to “two sets of sensor screws having improper torque and threading issues”. A look at Emergency Air Worthiness Directive for this issue (AD No. 2019-08-51 dated April 18, 2019) reveals that the two screws in question are: “Two set screws that secure the potentiometer shaft to the AOA vane shaft [that] may have improper torqueing and no application of thread locker (Loctite) to secure the two set screws”. 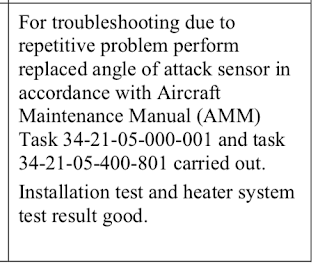 This could cause an offset in the AoA sensor output, just like that found in the two B737MAX incidents. Huh? Why does Boeing disable the column cutout when MCAS is on? The elevator lacks enough control power? Does the pilot have to use the control wheel? This can difficult or impossible under conditions.